Immediately after the Big Bang, the universe was a hot, dense plasma of electrons, protons and photons. This plasma was opaque to electromagnetic radiation (light), as the distance each photon could travel before scattering off another charged particle was extremely short. As the universe expanded, it also cooled. Eventually, the universe cooled to the point that neutral hydrogen formed (one electron and one proton joined together). The ratio of of free electrons and protons compared to neutral hydrogen atoms decreased to about 1 in 10,000. This era of the "phase change" of random electrons and protons into neutral hydrogen atoms is called the "Recombination Era". This occurred about 380 "thousand" years after the Big Bang. As a by product of the formation of hydrogen, electromagnetic radiation (light) could now freely travel so that the universe became transparent. Once the photons (electromagnetic radiation) became decoupled from the hydrogen, they traveled all around the universe and are still traveling today. They are now what we call the Cosmic "Microwave" Background (CMB) because as the universe expanded so did the tiny "gamma" waves. Thus, we can never "see" anything earlier than 380,000 years. The state of the universe as it was 380,000 years after the Big Bang is sometimes referred to as the last "scattering surface". The second phase change, occurred once objects started to form in the early universe. As these objects (stars and galaxies) formed and radiated energy, the universe went from being neutral back to being an ionized plasma. This second phase change era is called "Reionization". 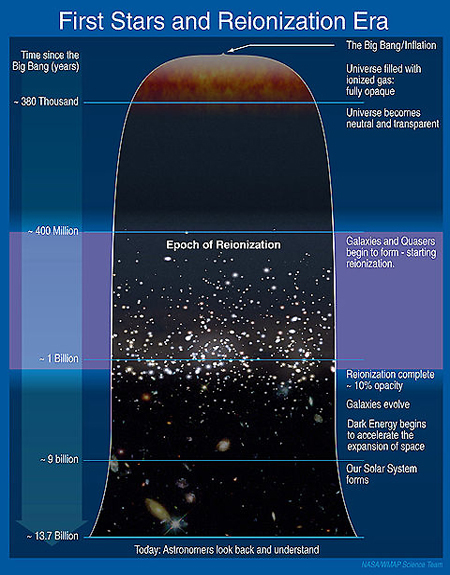 Recent data has lead astro-physicists to estimate that reionization started as early as 180 "million" years after the Big Bang (as opposed to 400 million in the NASA chart to the left). It lasted about 770 million years until the universe was about 950 million years old. The early universe was very violent during reionization. 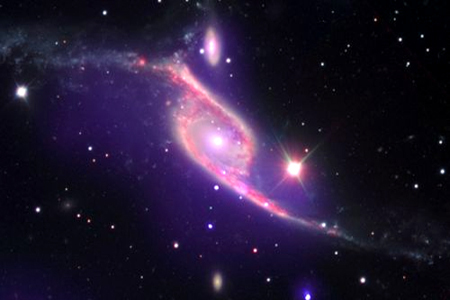 Galaxies grew quickly and evolved into monsters swallowing up smaller galaxies. The first stars were probably hundreds of times more massive than the sun and millions of times as bright. They most likely burned for just a few million years before exploding as supernovas. It is believed that the strong ultraviolet radiation from these early stars split hydrogen atoms back into electrons and protons, thus ionizing them a second time. Dark Nebula are interstellar clouds that are so dense that they block all light from stars and other sources of visible radiation that are behind them. The blocking of all visible light is caused by a super large, dense collection of dust grains located in the coldest parts of interstellar clouds. However, they can be studied using infrared and radio frequency techniques. Dark Nebula are a collection of sub-micrometer (less than a a millionth of a meter) sized dust particles, coated with frozen carbon monoxide and nitrogen. They block all light at visible wavelengths. The shape of Dark Nebula is very irregular, they have no clearly defined boundaries. Dark Nebula are the spawning grounds of stars and planets. 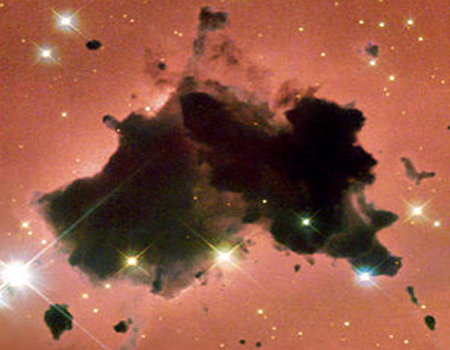 Bok Globules are small interstellar clouds of very cold gas and dust, i.e. small Dark Nebula. See the image at the left of Thackeray's Globules, a set of Bok Globules in IC 2944. Bok Globules were originally described as black splotches in front of dense fields of stars by Bart Bok of the University of Arizona in the 1940s. Bok Globules typically have a mass of about 2 to 50 solar masses within a light year or so end to end. In Cosmology, the "Solar Nebula Model" is the most widely accepted model explaining the formation and evolution of our sun and solar system. This model is now being applied to star and planet formation across the universe. According to the Nebula Model, stars form in massive, dense clouds of hydrogen. When a random dense region inside the clouds attracts enough matter, it starts to collapse under its own gravity. The center of the proto-star keeps growing denser and hotter until thermonuclear fusion begins. A new star is now born. Hydrogen atoms then begin to combine to form helium atoms, which releases the energy that makes the star begin to shine. See the NASA early star simulation image to the left. An interstellar cloud is normally several light years across. A small random clump in the cloud causes a contraction to begin. The clump begins to grow and eventually produces a run-away process. The gravitational collapse is much more efficient along the spin axis, so the rotating ball collapses into a thin disk with a diameter of about 200 AU (one astronomical unit is the distance from the earth to the sun) with most of the mass concentrated near the center. As the cloud contracts, its gravitational potential energy is converted into kinetic energy of the individual gas particles. Collisions between particles converts this energy into heat. The solar nebula becomes hottest at the center where most of the mass is condensing to form the proto-sun (the cloud of hot gas that eventually becomes the sun). At some point the central temperature rises to about 10 million degrees K. The collisions among the atoms are so violent that nuclear reactions begin. At this point a sun is born as a new star. What prevented further star collapse? As the central temperature and density increased, so did the internal pressure resulting in a force pushing outward. After 50 million years, the new star reached a balance between the gravitational forces pulling inward and the internal pressure pushing outward. This equilibrium of forces determined the diameter of the star. Star formation is a complex process, which always produces a gaseous proto-planetary disk around the young star. A sun-like star usually takes about a 100 million years to form. The proto-planetary disk is an accretion disk which proceeds to feed mass to the central star. Initially very hot, the disk later cools forming small dust grains of tiny rocks and ice. These grains eventually coagulate into kilometer-sized planetesimals. If the disk is massive enough runaway accretion begins, resulting in the rapid (100,000 to 300,000 years) formation of moon-sized planetary embryos. Near the star, the planetary embryos go through a stage of violent mergers, producing a few earth-sized planets. This last stage takes around 100 million to a billion years. See actual early star formation in the Magellanic Cloud at the left. The process of an accretion disk forming planets is much different from an accretion disk surrounding a black hole. In the planet context, accretion refers to the process of cooled, solidified grains of dust and ice orbiting the proto-star colliding and sticking together and gradually growing. This includes the high energy collisions between sizable planetesimals that combine to ultimately make larger and larger planets. The star formation process results in planet type gaseous accretion disks around all young stellar embryos. About one million years old, 100% of all stars have accretion disks. This conclusion is supported by the gaseous, dusty disks observed around proto-stars as well as by theoretical analysis. In February, 2014 the international media trumpeted the discovery by Australian scientists of the oldest star in the universe - SM 0313. SM 0313, shown at he left, was born about 13.6 billion years ago - just about 200 million years after the Big Bang (13.8 billion years ago). Remarkably, it is located right in our own Milky Way just 6,000 light years away. Scientists suggest that SM 0313 is an elusive Population II star - a star that was formed in pristine gas from the remnants of one of the universe’s very first supernova explosions. However, only six months earlier, HD 140283 the "Methuselah Star", whose estimated age was 14.46 billion years, was touted as the oldest star in the universe. That age would make HD 140283 older than the universe, but the uncertainty in the age calculation of plus or minus 800,000 years, would bring it back to 13.66 billion years, in line with current cosmological measurements of the universe's age of 13.8 billion years. The Methuselah star has lived through many changes over its long life. It was likely also born in a very early dwarf galaxy. The dwarf galaxy eventually was gravitationally shredded and sucked in by our emerging Milky Way about 12 billion years ago. The star retains its very elongated orbit from that cannibalistic merger. It is passing through our local solar neighborhood at a speed of 800,000 miles per hour. The Methuselah star has been known for more than a century because of its fast motion across the sky. The high rate of speed is evidence that the star is only a visitor to our neighborhood. Its orbit carries it down through the plane of our galaxy from the ancient halo of stars that encircle the Milky Way. It will eventually return to that halo. The discovery of SM 0313 may be the oldest known star in the universe, but given the uncertainties involved in the calculations, maybe it isn't. To understand the age of stars, we have to understand how they were formed and how they have evolved. Realizing the complexities of the physics involved, the uncertainties of the early universe, and other factors in the calculations, precise dating is very difficult and 13.6 billion years old should be taken as an educated estimate. As mentioned in the very first section above, the second phase change of the universe, Reionization, occurred once objects started to form. The universe was very violent during Reionization, which lasted from a "revised" 180 million years after the Big Bang until about 950 million years. The universe went from being totally neutral, back to being an ionized plasma. Electromagnetic radiation, i.e. light, was able to travel freely. Once the light photons became decoupled from hydrogen atoms, they traveled all around the universe and are still traveling today. "Finding a miniscule radio signal has opened a new window on the early universe," says Judd Bowman Astronomer and Professor at ASU, the lead investigator on the project. "Telescopes can not see far enough to image such ancient stars, but we've seen them when they turned on in radio waves arriving from space." "You start seeing the hydrogen gas dip at a particular radio frequency (78 megahertz)," says co-author Alan Rogers of MIT. "This is the first real signal that stars are starting to form". Slowly, gravity began to compress the densest regions of early plasma gas. Matter coalesced, collided, and collapsed. Very dense regions were created which formed the first stars. Comprised of just hydrogen and helium (the only elements that existed in the early universe) they burned "blue", very bright and fast. 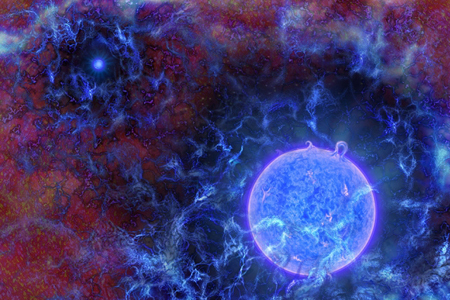 (See an NSF artist's conception of a blue star to the left.) But when the blue stars died, they produced explosions that gave rise to the heavier elements, including carbon and oxygen atoms on which all life depends. 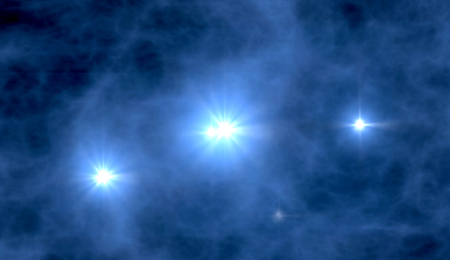 No telescope today can detect the glow of these primitive stars. But theoretical models suggest that their ultraviolet radiation would have pierced the hydrogen haze of the early universe, exciting some of the atoms within it. This in turn would cause the atoms to absorb a small sliver of the cosmic microwave background radiation, imprinting it with a faint but indelible signature. In a 1999 study, MIT astrophysicists, including Judd Bowman (a graduate student at the time), proposed that researchers could detect the signature by searching the entire sky for the affected wavelengths, which would appear as a dip in the radio end of the cosmic microwave spectrum. Such a project would require only a small antenna, but incredibly careful analysis because the dip overlaps with the most popular frequencies on the FM radio dial, as well as many natural radio signals. Peter Kurczynski, the program director for the National Science Foundation (NSF) who funded the effort beginning in 2009, compared the project to turning on every radio station but one simultaneously, then listening to figure out which station was missing. 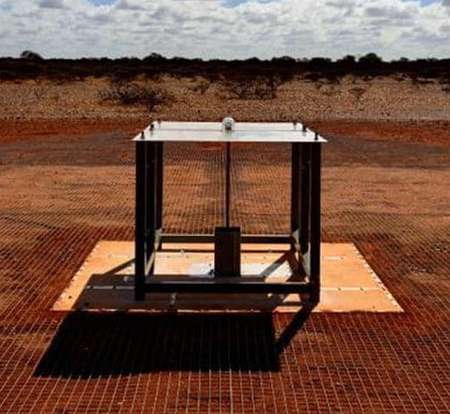 The project consisted of the construction of an antenna in the rural Australian desert to listen for the delicate signal. The instrument was deceptively simple, just two metal plates perched atop a dining room table type structure and situated at the center of a 30 meter wide mesh carpet. But it sensed everything: all human radio communication, radio waves coming from the Milky Way and buried in all of it, the subtle buzz of the cosmic microwave background. “The cosmological signal is 0.1 to 0.01 percent of the total amount of radio power we were receiving,” said Judd Bowman. But by subtracting out all the louder signals, Bowman and his colleagues were able to pin down the signature of emerging stars emanating from 180 million years after the Big Bang. 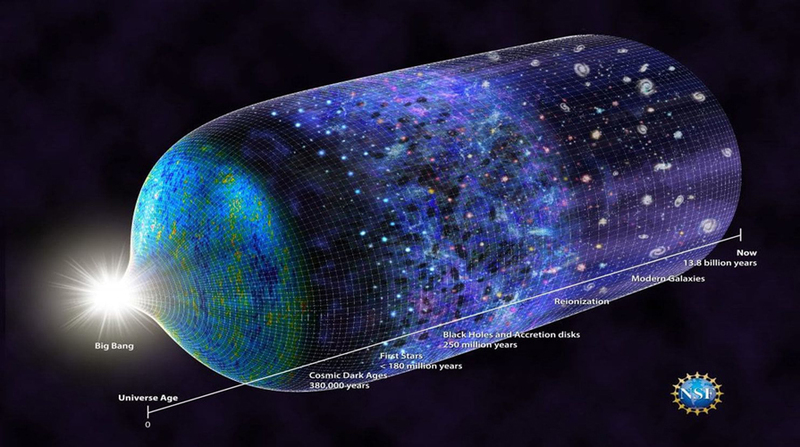 See the revised Timeline of the Universe by the NSF below. The Nebula Model builds galaxies by the merging of interstellar cold, dense gas clouds. These globules started collapsing into galaxies when the universe was very young. Then the early galaxies would be drawn into clusters and clusters into super clusters by their mutual gravity. This model predicts that there should be many more small galaxies than large galaxies and this is observed to be true. Galaxy clusters and super clusters should still be in the process of forming today. Observations suggest this is also true. 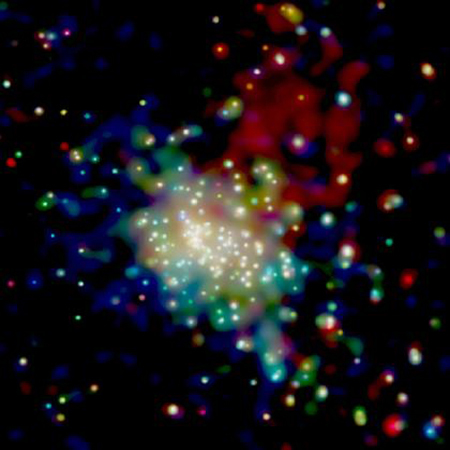 See the X-ray image to the left of the young star cluster RCW 38. All the white dots are hot young stars forming a new galaxy cluster. NASA's Chandra has detected about 200 new stars being born in RCW 38. Recent versions of the Nebula Model incorporate dark matter that is known to make up most of the mass of the universe. Huge dark matter super clusters come together because of gravity and form a network of filaments. Where dark matter filaments intersect and form dense regions, regular matter coagulates into galaxies and galaxy clusters. One version of the model says that the very densest dark matter regions have more rapid star formation and make elliptical galaxies while the lower density concentrations make spiral galaxies and dwarf galaxies. Visible matter is at the very densest part of large dark matter clouds which are out of sight. Some dark matter clumps may contain only cold hydrogen and helium gases making "dark nebulae" that are not concentrated enough to begin star formation. Dark Matter Evidence. 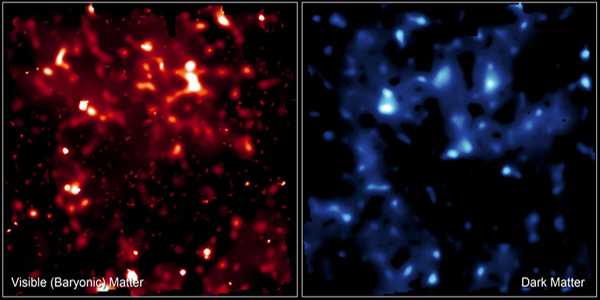 The two false-color Hubble maps at the left compare the distribution of normal matter (red) with dark matter (blue) in the exact same area of the universe. The brightness of the clumps corresponds to the density of their mass. 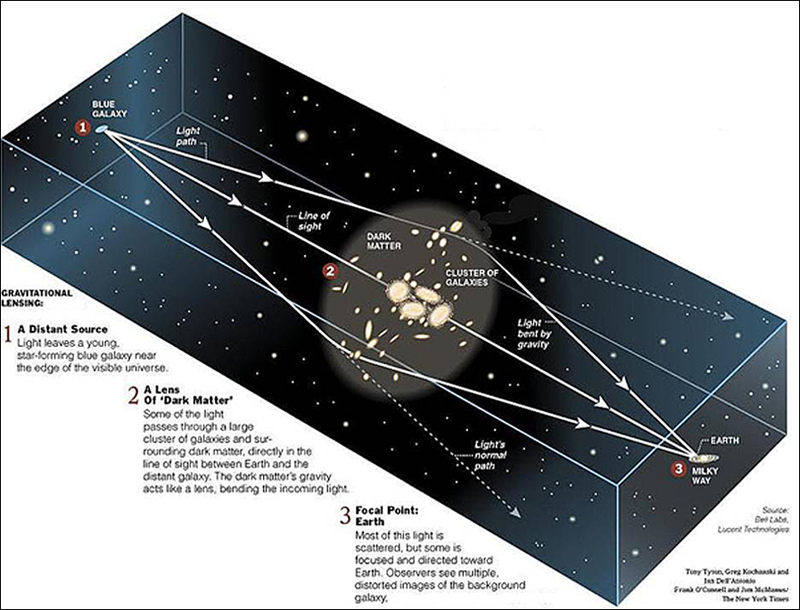 It demonstrates how normal matter (stars, galaxies and gas) is concentrated inside a surrounding cloud of dark matter, and how the densest dark matter areas condense into normal matter. 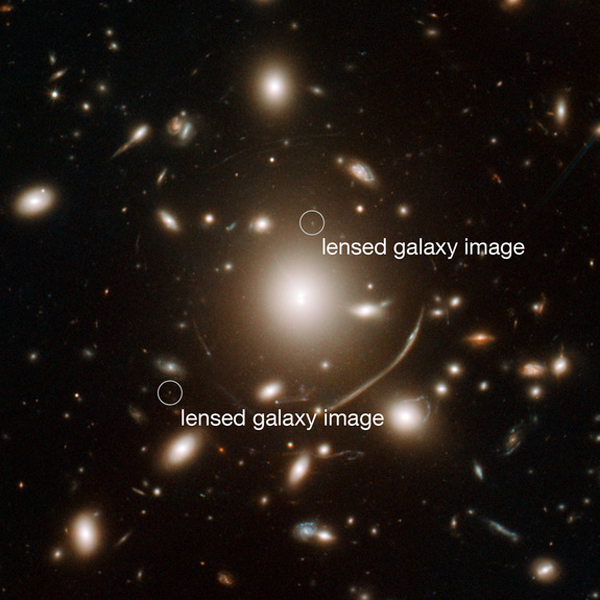 Because dark matter can't be seen directly, its distribution was determined by using gravitational lensing techniques (see the "Searching For The Oldest Galaxies" section below). The above images were constructed from Hubble's largest ever survey of the universe, the Cosmic Evolution Survey (COSMOS). In making the COSMOS survey, Hubble photographed 575 adjacent and slightly overlapping views of the universe using the Wide Field Camera. It took about 1,000 hours of observations. The distribution of additional gas outside of the galaxies was achieved using ESA's XMM/Newton telescope. All this was accomplished with an international team of 70 astronomers from NASA, ESA, and R. Massey of the California Institute of Technology. Other Models. Astronomers from Cardiff University in Wales, UK observed about 10,000 galaxies currently present in the universe using a survey of the sky created by the Herschel ATLAS and GAMA projects. The researchers classified the galaxies into the two main types: flat, rotating, disc-shaped galaxies (much like our own galaxy, the Milky Way); and large, oval-shaped galaxies with a swarm of disordered stars. Using the Hubble and Herschel telescopes, the researchers then looked further out into the universe (thus further back in time) to observe galaxies that formed shortly after the Big Bang. 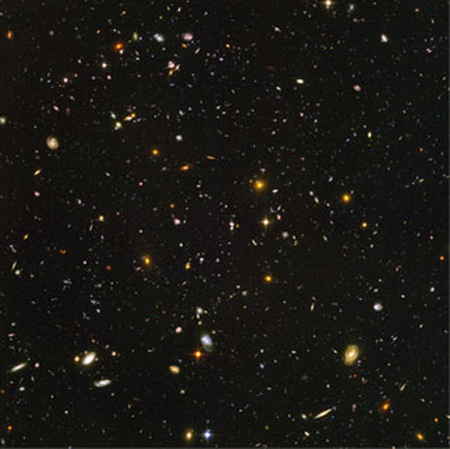 See the Hubble Deep Field View of 1,000 such galaxies to the left. The researchers showed that 83% of all the stars formed since the Big Bang were initially located in a disc-shaped galaxy. However, only 49% of stars that exist in the universe today are located in disc-shaped galaxies. The 51% remainder are located in oval-shaped galaxies. The results suggest a massive transformation in which disc-shaped galaxies became oval-shaped galaxies. Galaxies come in a very wide range of sizes and shapes. 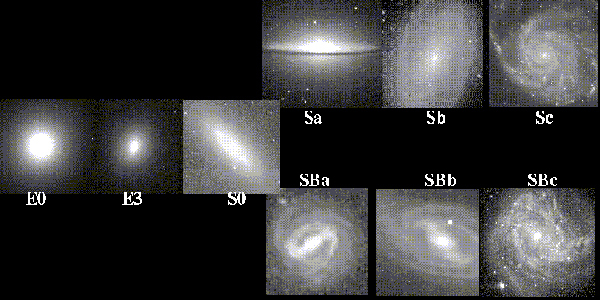 Edwin Hubble, who studied galaxies for years, came up with a classification scheme (shown on the left) to categorize the galaxies basic characteristics. Because of its shape it is often referred to as "Hubble's Tuning Fork". To this day, the Hubble sequence is the most commonly used system for classifying galaxies in astronomical research. One of the drawbacks of the Hubble scheme is that it depends purely on visible light. Hubble classified galaxies into 4 broad categories: ellipticals, spirals, lenticulars, and irregulars. Ellipticals - Elliptical galaxies have smooth, featureless light distributions and appear as ellipses in photographic images. They are denoted by the letter E. The ellipticity increases from left to right on the Hubble diagram, with circular (E0) galaxies situated on the very left. have a bar-like structure extending from the central bulge, at the ends of which the spiral arms begin. 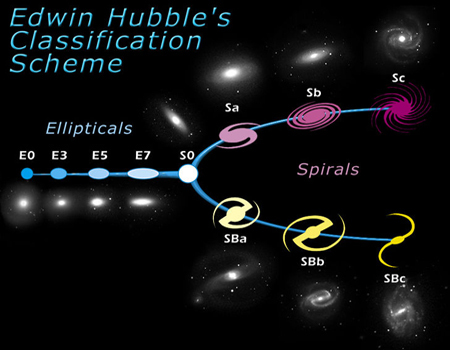 In the Hubble diagram, the regular spirals occupy the upper branch and are denoted by the letter S, while the lower branch contains the barred spirals, given the symbol SB. See some samples of the various galaxy types at the left. Lenticulars - At the center of the Hubble diagram where the spiral arms meet is an intermediate class of galaxies known as lenticulars represented by the symbol S0. These galaxies consist of a bright central bulge surrounded by an extended disk-like structure. The disks of lenticular galaxies have no spiral structure and are not actively forming stars in any significant quantity. The bulge component is the dominant source of light. The three-way alignment of an original distant blue galaxy, a galaxy lens cluster and the earth, vastly amplifies the light reaching us from the blue galaxy allowing astronomers to make detailed observations not otherwise possible. See the illustration above. Using galaxy Abell 383 as a gravitational lens, astro-physicists were able to observe "one" of the oldest galaxies in the universe. Abell 383, with its very strong gravity field, bends the rays of ancient light like a huge magnifying glass. See the actual Hubble image at the left. The ancient galaxy is visible as two tiny dots on either side of Abell 383. (Distant objects seen through gravitational lenses are typically multiple imaged and heavily distorted.) Without the gravitational lens, the galaxy would have been too faint to be observed even with today’s largest telescopes. The galaxy is made up of very faint stars about 750 million years old, making the galaxy's formation about 200 million years after the Big Bang. That makes the galaxy's formation about 200 million years earlier than the oldest previously known galaxy. This is younger than expected as the previous estimates for the start of reionization were about 400 million years after the Big Bang. This finding could force astronomers to rethink the timing and the formation of stars and galaxies in the early Cosmos. Using the Keck-2 telescope in Hawaii, the team then analyzed the galaxy's light, determining its redshift. Redshift measures the distance that an object has moved away from earth as space expands by the stretching of the object's light to longer (redder) wavelengths. The remote galaxy’s redshift is 6.027, which means we see it as it was when the universe was about 950 million years old. This does not make it the furthest galaxy ever detected One has been detected with a redshift of 10.7 which makes it about 420 million years old. See the next section. In March, 2016 the oldest and most distant known galaxy, GN-z11, appears as a very small blob in the night sky. See the Hubble picture to the left. But it offers a peek back into a time when the universe was only 400 million years old after the Big Bang. The galaxy produced light that has traveled 13.4 billion years to reach the earth. GN-z11 has a redshift of 11.1, the highest "galaxy" redshift ever recorded (that was not a temporary flash). 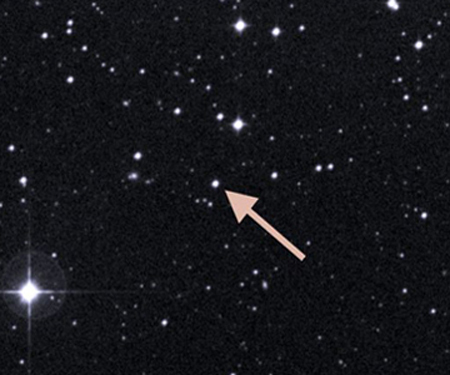 The research team used Hubble’s Wide Field Camera 3 (WFC3) to measure the distance to GN-z11 spectroscopically, splitting the light into its component colors to measure the redshift. This was the first time that the distance of an object so far away has been measured by using its spectrum. This makes the measurement extremely reliable. GN-z11 is 25 times smaller than the Milky Way and has 1% of the Milky Way Galaxy’s mass in stars. It is likely in the first phase of forming a larger galaxy as it is forming stars at a rate about 20 times faster than the Milky Way does today. 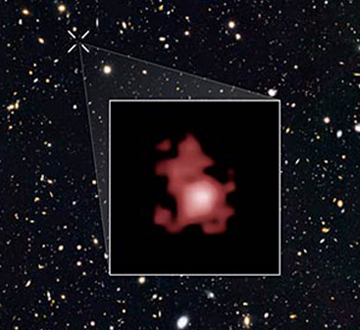 The extreme distance measurement of GN-z11 provides strong evidence that we are closing in on the first galaxies that formed in the universe. Its remote position puts GN-z11 at the beginning of the re-ionization era. In this period starlight from the first galaxies started to heat and lift the fog of cold hydrogen gas that filled the universe at that time. The Pinwheel Galaxy, also known as Messier 101, M101, and NGC 5457, is 21 million light years from earth. The portrait to the left is actually composed of 51 individual Hubble exposures. It is about 70% larger than our own Milky Way, with a diameter of about 170,000 light years. M101 is estimated to contain hundreds of billions of stars. In August, 2011, a Type Ia supernova, SN 2011fe, was discovered in M101. This was the fourth supernova recorded in M101. Spiral galaxies, like M101, have well-defined spiral arms that wind around the galaxy within a rotating pancake-shaped disk. In this Hubble “face-on” view of M101, bright blue areas of star formation pepper the spiral arms, which look like the arms of a pinwheel. Dark, thin dust lanes follow the spiral structure into a yellowish central bulge containing older stars. Many of the stars are smaller, cooler, and redder than our Sun. The hot, blue stars along the spiral arms are so bright that they really stand out in this image. that the galaxy’s disk is really mostly empty space. 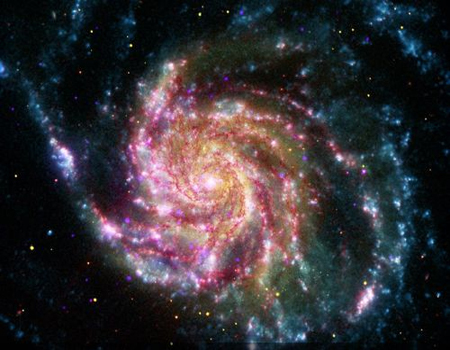 The second image of the Pinwheel Galaxy to the left combines data in the visible, infrared, ultraviolet and x-ray spectra from four different NASA space telescopes. This multi-spectral view shows that both young and old stars are about evenly distributed along M101's tightly-wound spiral arms. The red colors in the image show infrared light, as seen by the Spitzer Space Telescope. These areas show the heat emitted by dusty lanes in the galaxy arms where stars are forming. 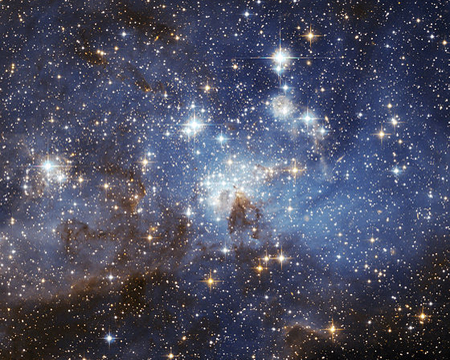 The yellow component is visible light, observed by the Hubble Space Telescope. Most of this light comes from stars. They trace the same spiral structure as the dust lanes seen in the infrared. The largest known galaxy is NGC 6872, a spiral found 212 million light years away in the southern constellation Pavo. The distance between NGC 6872's two huge spiral arms, tip to tip, is 522,000 light years. This makes it 5 times larger than the Milky Way which is about 100,000 light years wide. NGC 6872 has ranked high among largest spiral galaxies for decades. However, it was only recently determined to be the largest after a detailed study by a number of instruments, including NASA's Galaxy Evolution Explorer spacecraft, GALEX. NGC 6872's bar, which links the galaxy's arms and its central regions, is also huge. 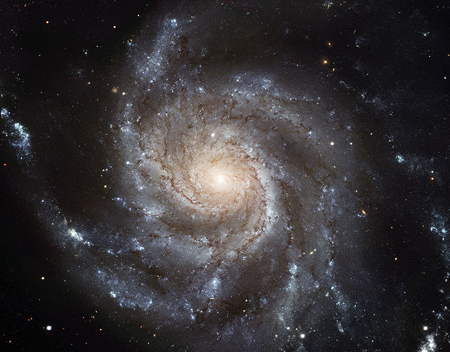 With a radius of 26,000 light years, it is about twice as big as the bars of nearby spirals. No evidence of recent star formation is apparent in NGC 6872's bar, suggesting that it formed several billion years ago or more. NCG 6872's enormous size and odd appearance are the consequence of its gravitational interaction with a neighbor galaxy called IC 4970, which contains just 20 percent of NGC 6872's mass. Computer simulations suggest that IC 4970 made its closest approach about 130 million years ago, stirring up a burst of activity in certain parts of NCG 6872. The Andromeda Galaxy, also known as Messier 31, M31, or NGC 224, is a spiral galaxy approximately 2.5 million light years from earth. The Andromeda Galaxy is the nearest spiral galaxy to our Milky Way, but not the closest galaxy. (There are quite a few dwarf galaxies nearby.) It is the largest galaxy in the "Local Group" of 50 galaxies with about a trillion stars. The Milky Way is the second largest galaxy with roughly 300 billion stars. Andromeda was born about 10 billion years ago from the merger of many smaller proto-galaxies, resulting in a galaxy smaller than the one we see today. Andromeda, as we see it today, was formed out of the collision of two smaller galaxies that took place 8 billion years ago. 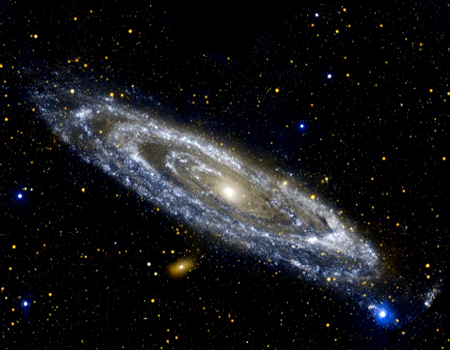 In the last two billion years Andromeda has absorbed some of its smaller satellite galaxies. Andromeda has a "blue" shift (opposite of a red shift) of -.001. The minus sign means that Andromeda is coming towards the Milky Way at about 75 miles per second (270,000 mph). The two galaxies are expected to collide in about 4.5 billion years. A likely outcome of the collision is that the galaxies will merge to form a giant "elliptical" galaxy. When two galaxies collide, simulations show the stars will pass right on by each other without colliding. The distances between stars is so large compared to the sizes of the stars that star to star collisions are very rare. . While the distances between galaxies is large, compared to the size of the galaxies, the distances are not extreme. Stars, inside two galaxies that have merged, do not collide because the distances between them are hundreds of thousands to millions of times larger than the size of the stars. The distances between galaxies are only a few tens of times bigger than the individual galaxy sizes. Andromeda, our closest large galaxy, is only about 30 Milky Way diameters away.